Traditional materials and craftsmanship. Minimalist contemporary design. Starting today and continuing all next week we’ll be running a series of gift guides featuring a mix of our own products and our favorite gift items from designers in California and beyond. Like our own work, many of the items on these lists combine traditional materials and craftsmanship with minimalist contemporary design. 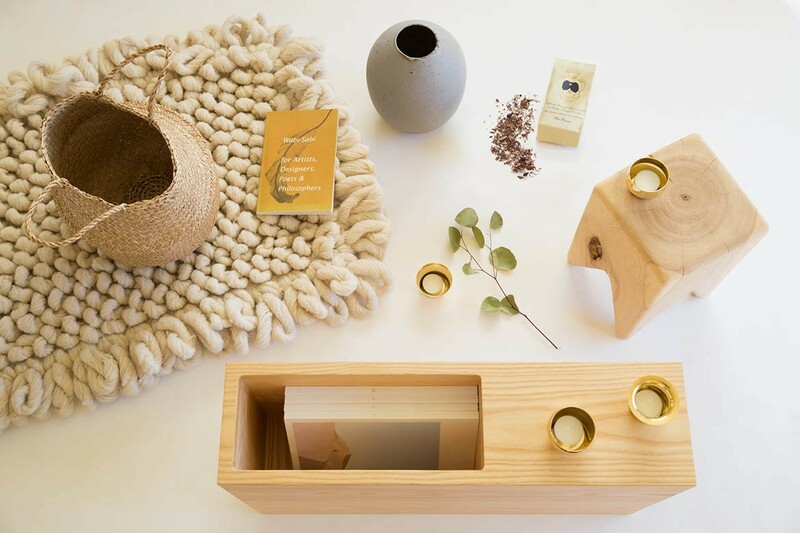 For the home we like a mix of natural materials, hard and soft, functional and beautiful. We look for pieces that can be used in different ways, that can grow and adapt with the changes in one’s home and life. Enter the coupon code ‘giftguide30’ to receive 30% off for today only on the Kalon items listed in this guide. With their thoughtfully designed storage compartments, our hardwood units are a great addition to any room of the house wherever a little extra surface area or storage is needed. Crafted into a contemporary form but leaving the raw, natural features of the wood, our Stumps are perfect for providing an extra seat, a side table, or a unique accent piece to any room. Thrown by hand in her Los Angeles studio, Victoria Morris’ ceramic vases and lamps draw upon modern Scandinavian forms and traditional Japanese aesthetics to create objects as useful as they are beautiful. These super-plush wool rugs, made in Mexico by traditional artisans, are soft and cozy under foot or a cool, textural hanging on the wall. These versatile baskets can collapse to half their size. They’re perfect for any room of the house, to hold produce, indoor plants, toys, blankets, winter gear or any other odds and ends. Produced by 400-year-old Swedish brass foundry Skultuna, this set of five small, simple votives is made from polished brass. The brass reflects a warm glow when the candles are lit, bringing a delicate light to dark winter days. Made from a secret blend of organic herbs and flowers grown in the Florentine hills, using the same methods that have been passed down for centuries, Santa Maria Novella pot pourri lends a rich, aromatic fragrance too unique to describe. Perennially popular with designers of all sorts, Wabi-Sabi is Leonard Koren’s classic essay on that elusive Japanese aesthetic of imperfection and impermanence.